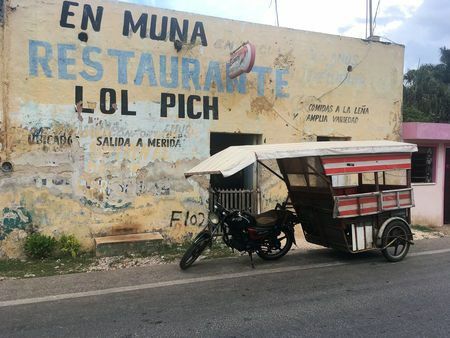 SAN JOSÉ TIPCEH, Mexico (Reuters) – The Yucatan peninsula, dividing the Gulf of Mexico from the Caribbean, is among Mexico’s top destinations for renewable energy firms thanks to its strong winds and sunny climate. Home to bustling tourist resorts such as Cancun, the area is also a big energy consumer. But some of its Mayan indigenous communities are resisting rapid development of $1.1 billion of renewable energy projects and preparing to fight a plan to build a railway across the peninsula. President-elect Andres Manuel Lopez Obrador, who takes office on Saturday, wants to fast track the construction of the tourist and freight line. “In the communities, there is concern that their opinion will not be taken into account once again with this project,” said Carlos Escoffié, lawyer for the Collective of Mayan Communities in the Chenes region. In San Jose Tipceh, a town of 500 people surrounded by jungles, indigenous leaders delayed by 18 months a multi-million dollar renewable energy project by U.S.-based solar company SunPower Corp <SPWR.O>, which planned to begin operations in August. “We are practically selling our families for a little bit of money,” said resident Damián Mugarte, threatening to take the battle to Mexico’s highest court. Indigenous resistance capitalises on a law passed in the wake of the 1994 Zapatista uprising in southern Mexico that compels the government to consult with indigenous people for projects on their land. But the rules are ambiguous for investors and communities alike. Some experts warn that unless the new government puts in place clear guidelines all sides agree on, the issue has the potential to stall railways, ports, mines and other infrastructure projects. “If not fixed, the problem can become the main obstacle for economic growth,” said Hector Garza of international law firm Ritch Mueller who has advised the current government in developing the legal framework for this process. Rodolfo Salazar, who heads the consultation department for the current government at the Ministry of Energy, said rules put in place had helped resolve some conflicts but acknowledged they were not adequate to win the trust of indigenous populations. Left-leaning Lopez Obrador has pledged to amend the constitution to further reflect the indigenous rights, a move that will force the government and companies to pay more heed to their concerns. That may make it harder to build the Mayan Train, a 1,525-km (948-mile) railway planned in the states of Yucatan, Quintana Roo, Campeche, Tabasco and Chiapas, connecting the rainforest and the beach. It could also spell difficulties for another railway to connect the Pacific and Atlantic oceans, which Lopez Obrador hopes could boost the economy of the poor southern state of Oaxaca. In an effort to win popular backing for the project, Lopez Obrador last week held a national referendum on the Mayan Train and nine other policy initiatives – including an oil refinery in the Gulf of Mexico – as part of his pledge to allow greater popular say in government decision-making during his six-year term. But the referendums have stirred controversy because of low participation rates and opaque monitoring of results. Only around 950,000 people voted in the Nov. 24-25 consultation, representing just 1.1 percent of eligible voters. His first consultation last month called for cancelling the construction of a partially built $13 billion airport for Mexico City – sending the peso currency <MXN=> and the stock market <.MXX> sharply lower as investors fretted over how he would manage the economy. Although Lopez Obrador vowed to respect the opinion of towns and villages affected by the Mayan Train, he has also pledged to launch a tender to find a private sector partner for the project soon after he takes office. In Yucatan, activists say that none of the 163 communities through which the train will pass have been provided with information about the project. The fear is that “they will find people close to the government to simulate popular support, something which has happened repeatedly on the peninsula,” said Escoffié, of the Collective of Mayan Communities. Rights groups, including Amnesty International, have highlighted the need for consultations on projects that will drive through some pristine natural habitats and indigenous lands.